This is a gently used Smartphone Projector 2.0. It is in good condition. Everything originally included is in the box. !! !~~~New/Display~~~DIY Luckies Vintage Smartphone Projector !!! Ending May 3 at 12:09AM PDT8d 20hFeatures: Ceiling ProjectionController: Smartphone/Tablet Control App. About the Item: With the projector, you can project videos on the wall, watch a film in bed or set up visuals for a house party. However you use it, it’s the most sophisticated way to turn your small screen into the big screen. Feature: 1.Retro appearance with brown skin. Looks high-end. 2.No assemble required. You can make it into use as long as you open the package. 3.Fits phones up to a maximum size of 80mm x 160mm and 3.2 x 5.7 inches. 4.It is also a DIY intelligent projector. You can do the assembling by yourself. 5. V2.0 Smartphone Projector DIY Portable Mobile Phone Theater Cinema. Easy setup. V2.0 Smartphone Projector DIY Portable Mobile Phone Theater Cinema. Easy setup.. Condition is Used. Shipped with USPS First Class Package. LUCKIES Smartphone Projector V2.0, Cinema in a Box! DIY Portable Mobile Phone. Condition is New. Portable DIY Cardboard Smart Phone Projector Cinema Mini Projector Toy Gift. The smart phone projector makes a fun DIY project, you just need glue or double side sticky tape and about 10 to 15 minutes. About the Item: With the projector, you can project videos on the wall, watch a film in bed or set up visuals for a house party. However you use it, it’s the most sophisticated way to turn your small screen into the big screen. Feature: 1.Retro appearance with brown skin. Looks high-end. 2.No assemble required. You can make it into use as long as you open the package. 3.Fits phones up to a maximum size of 80mm x 160mm and 3.2 x 5.7 inches. 4.It is also a DIY intelligent projector. You can do the assembling by yourself. 5.Good lens lead to clear visuals. The perfect present for the gadget lover with a taste for the finer things in life, they can make the most of their HD smart phone screens but with a touch of classic luxury design. 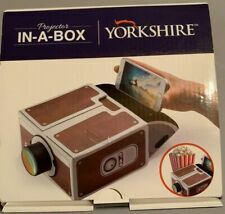 Made from cardboard, Smartphone Projector is light, compact and totally portable. Box has been opened, but item has never been used. All pieces are present to use to turn your smartphone into a movie projector. The smart phone projector makes a fun DIY project. 1 DIY 3D projector cardboard. Silicone grip pad to hold smart phone. Material: paper. Fits phones up to a max size of 17.5 16.5 10.5cm. To reverse a screen on smart phone, just download an app. Slightlyused Smartphone Projector 2.0. Requires a really dark room for best results. WATCH MOVIES FROM YOUR SMARTPHONE ON THE GO WITH THIS HANDY DANDY SMARTPHONE PROJECTOR 2.0. The smart phone projector makes a fun DIY project. 1 DIY 3D projector cardboard. Silicone grip pad to hold smart phone. To reverse a screen on smart phone, just download an app. Material: paper. Cardboard DIY smartphone projector. This is a projector made of cardboard. Do it yourself projector. 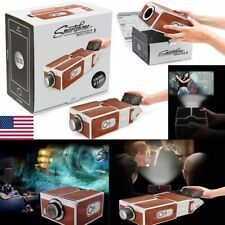 Cardboard Smartphone Projector Video Film Projector Cinema DIY Family Theater us. Condition is New. Shipped with USPS Priority Mail. The smart phone projector makes a fun DIY project, you just need glue or double side sticky tape and about 10 to 15 minutes. Type: Overhead Projector. Silicone grip pad to hold smart phone. To reverse a screen on smart phone, just download an app. DIY smartphone projector has been upgraded tothe second generation, which is more fashionable than the previous generation. The first generation is complicated to assemble, and the second generation is simpler. Easy for you to use, just install the projector lens. The size of smart phone that put into the projector is no more than 16 8cm / 6.3 3.15in. Provide you wonderful DIY Fun. 1 Projector. Project the videos or films from your smart phone to the wall. Silicone grip pad to hold the smartphone. To reverse a screen on your smartphone, you just have to download an application. Projection distance: 1-2 M. The smart phone projector makes a fun DIY project, you only need glue or double-sided tape and between 10 and 15 minutes. With the projector, you can project videos on the wall, watch a film in bed or set up visuals for a house party. However you use it, it’s the most sophisticated way to turn your small screen into the big screen. Portable DIY Cardboard Smart Phone Projector Cinema Mini Projector Toy Gift. The smart phone projector makes a fun DIY project, you just need glue or double side sticky tape. Type: Overhead Projector. Item Type: Smartphone Projector. You can do the assembling by yourself. With the projector, you can project videos on the wall, watch a film in bed or set up visuals for a house party. However you use it, it’s the most sophisticated way to turn your small screen into the big screen. Easy for you to use, just install the projector lens. The size of smart phone that put into the projector is no more than 16 8cm / 6.3 3.15in. Provide you wonderful DIY Fun. 1 Projector. 1 Lens Casing Pipe. 1 Cardboard Smartphone Projector. Retro appearance with brown color. Material: Paper Board. 1,The real color of the item may be slightly different from the pictures shown on website caused by many factors such as brightness of your monitor and light brightness. Item Type: Smartphone Projector. 1 Cardboard Smartphone Projector. You can do the assembling by yourself. With the projector, you can project videos on the wall, watch a film in bed or set up visuals for a house party. Features: 100% brand new and high quality Retro appearance with coffee skin, easy to assemble Fits phones up to a maximum size of 80mm x 145mm / 3.15 x 5. 1 Cardboard Smartphone Projector. 1,The real color of the item may be slightly different from the pictures shown on website caused by many factors such as brightness of your monitor and light brightness. The smart phone projector makes a fun DIY project, you just need glue or double side sticky tape and about 10 to 15 minutes. Tablet PCs. Type: Overhead Projector. Silicone grip pad to hold smart phone. 6 Cavity Silicone Muffin CupCake Cookie Chocolate Mould Pan Baking Tray Mold. Wind Spin Curl Hair Hair Roller Curler Salon Styling Tools Hair Dryer Diffuser. Portable Quiet USB Desk Fan Two Leaf Aroma Fan Gear Adjustable Office Cooling. Projection Distance: 1 - 2M. The smart phone projector makes a fun DIY project, you just need glue or double side sticky tape and about 10 to 15 minutes. - Projection effect is better in dark room, on the white wall. You can do the assembling by yourself. With the projector, you can project videos on the wall, watch a film in bed or set up visuals for a house party. However you use it, it’s the most sophisticated way to turn your small screen into the big screen. Wooden Smartphone Projector. Made entirely from rigid cardboard and printed to look just like a retro device, this stylish projector contains a high-quality glass lens with an impressive 8x magnification to really do your videos justice.